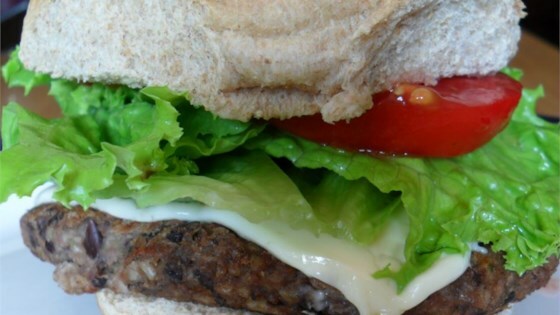 "I have two different veggie burger recipes and found that mixing them into one created the ULTIMATE veggie bean burger. My meat-and-potatoes firefighter husband LOVES these and says he could eat them every week!" Bring the brown rice and water to a boil in a saucepan over high heat. Reduce the heat to medium-low, cover, and simmer until the rice is tender, and the liquid has been absorbed, 45 to 50 minutes. Preheat an outdoor grill for high heat. Lightly oil a sheet of aluminum foil. Mash black beans in a large bowl with a fork until thick and pasty; set aside. Place the bell pepper, onion, mushrooms, and garlic in the bowl of a food processor, and chop finely. Stir the bell pepper mixture into the mashed black beans. Place the brown rice and mozzarella cheese in the food processor, and process until combined. Stir the mixture into the black beans. Whisk together the eggs, chili powder, cumin, garlic salt, and hot sauce. Stir the egg mixture into the black bean mixture. Stir in the bread crumbs, adding additional bread crumbs as needed until the mixture is sticky and holds together. Divide into 6 large patties. Place patties onto the prepared foil, and grill until browned and heated through, about 8 minutes per side. These 5-star veggie burgers have it all over frozen burgers. To bake the patties: Preheat oven to 375 degrees F (190 degrees C), and lightly oil a baking sheet. Place patties on baking sheet, and bake about 10 minutes on each side. I substitute flaxseed and water all the time for eggs. One egg is equal to one tbsp ground flaxseed plus 3 tbsp water. Works great - but gives a slightly nuttier flavour than eggs. This is so delicious! I made it for a backyard get together and even the "meat loving men" loved them! They are so yummy, especially if you top them with avocado.